A key premise for us to start with, as parents and as educators, is that the digital world and the online world are intricately connected. From the child’s perspective, there is no “online life” and “offline life.” There’s just “life.” The two are nearly seamless in their connectedness. The consequences of actions in the digital realm are just as real, and sometimes even more acutely felt, than in the face-to-face environment. Consider the complexity that the use of social media introduces to our job as parents. In the analog era—let’s call that before the 1980s—the task of raising a child involved social and emotional challenges at every age. Parents worried about their young kids making friends and learning to share in kindergarten. They sought to give their children strength not to submit to peer pressure as they entered middle school. They called upon the better angels of their children’s nature as they ran the gauntlet of the teenage years, with its manifold temptations and other challenges. Parents did everything they could to enable their children to become well-adjusted, confident, happy people as they launched into the world as adults. In the digital age, these questions remain at the core of what we worry about as parents. The essential nature of the challenge doesn’t change. What’s different in the digital age is that there’s another aspect to the problem. Our kids’ lives are mediated by technology much, though not all, of the time. Our children are living partly in a digital environment and partly in a face-to-face environment. Our job as parents and as teachers is to help children make good choices in their digital life, just as they must in the analog aspects of their lives. An eight-year-old has always needed to learn not to wander alone into a dangerous part of town or to accept rides from strangers lurking around a park. She still needs that lesson, but she also needs to learn to make good choices with respect to data she shares about herself online, how she presents herself to the public on her first social media sites, and what the consequences can be of making a mistake in these regards. As parents and as educators, we need to use these technologies ourselves in order to be good guides to our children and our students. In order to be credible to a confused young person, we need to be fluent in how these technologies work, how other people are using them, and what effects their use of these new technologies can have. We don’t have to become experts in every new app as it emerges on the scene, but we do need to get our hands dirty (or, more literally, “thumbs active”) enough to understand how to give decent advice. Most of the time, common sense should be a sufficient guide to children, but we all know that children can sniff us out quickly if we sound like we don’t know what we are talking about. Common sense also tells us that the most powerful way to influence the behavior of young people when it comes to technology use is for their peers to serve as a good influence, rather than as a negative force. (Not that we really need it, but social science research consistently confirms this point.) The goal for a school is to create a positive youth culture around technology use, not one that accepts or rewards bad behavior. Such a culture is more easily described than it is created, but it is the most powerful possible force. This culture is established at an independent school even before students arrive: the admissions office has much to do with whether the students who come to the school are selected on the basis of whether they are kind and empathetic or not. It is my firmly held view that the use of such criteria is essential in establishing a positive youth culture at any school. Once the culture is established, adults in the community have to play an active role in supporting students who make good decisions, making clear what behaviors are unacceptable, and enforcing the rules fairly and consistently—whether or not they have to do with technology usage. After co-authoring a book on youth and technology a few years ago, I toured many schools, both public and private, to give talks as an author and educator. One of the questions that came up nearly every time was whether the use of technology by young people could cause them problems later when they wanted to get into college or to get their first job. The answer to that question, then and certainly now, is “absolutely.” Our children have been born into the first generation where their lives are recorded, right from the start. Much of what they do as they grow up, they do in public. Their social lives, in particular, are mediated by technologies; the trails that they leave can last for a very long time. Students and their parents should assume that anything they post on a Tumblr, Facebook, Twitter or whatever service becomes popular next will be accessible to every admissions officer or human resources staffer in whose hands a decision may rest. Students may well be taking on the digital-age equivalent of tattoos, images that seem cool at one moment in time but which prove hard to rub off years later when they no longer appear as desirable. The rule that I suggest to my students and my own children in this respect is very simple. Before you put anything into any digital form—a text, an email, a posting on social media—pause for a moment. Think about whether you would be OK with that picture or text appearing on the front page of the New York Times tomorrow. If the answer is “no,” then don’t share it digitally. The problems that we need to help students to work through are manifold, but two jump out. One is the notion of persistence. The information that they share with one person may last forever on their phone or computer. It may be shared with others on purpose or inadvertently. Something shared on Snapchat and meant to disappear after a short while might be captured by the recipient on Snapsave. The second problem is the disinhibition effect. With social media, young people tend not to think as much as they should before they hit “send.” They will do things online that are riskier than they realize; they are insufficiently inhibited as it is, which can be exacerbated in the digital environment. It’s hard to say to a teenager to “stop and think before you act,” but it’s even more important in the digital age than ever. And here’s the good part: when we do our jobs well as educators, the use of technology can lead to greater learning outcomes for students. We know, from long experience, that it is not axiomatic that more technology equals better learning outcomes. We know that the use of technology in the service of sound pedagogy can make a great difference for many students. 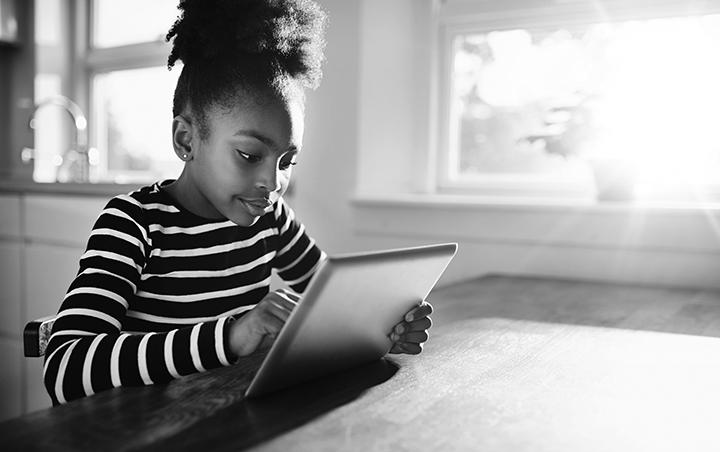 We know that technology can be a distraction for our kids: too much time playing video games (especially among boys); too often switching between tasks; too much cribbing from one another’s work or online material. It is our job as parents and as teachers to find the sweet spots and enable our students to take advantage of them. No one yet knows all the answers in these respects, but some things are becoming quite clear. Here are a few specific examples. We know for a fact that students do better when they have more frequent, clear, personalized feedback from their teachers. Technology can help in this respect. Teachers who use an iPad and Google Drive, for instance, to manage the submission of homework and the timely return of sound feedback, without the time and hassle associated with paper, can improve learning for their students in nearly any discipline. At our school, one teacher of Russian gives his students multiple rounds of feedback on their homework—in a single evening—mediated by their iPads. The technology is not doing the hard work, the teacher is. But the technology makes it much simpler and easier to accomplish this clear pedagogical goal. Feedback might take new forms, too, when good technology is available to help. Sometimes teachers cannot manage to give as much feedback directly to students as they would like. For instance, a school might have too many students and too few teachers. In these cases, the technology itself can give feedback on student work. For instance, a student who is taking pre-calculus in high school might be learning parametric equations in class. That same student might, for homework or even during class time, work through a series of short videos and problems using Khan Academy, the free online education resource. She will get a great deal of feedback on her level of mastery of parametric equations, based on her responses to the exercises. She can spend as long as she needs, or as little time as she needs, to complete the work. The data could easily be shared with a teacher so that the teacher can glean what the student understands—and to what depth—as well as what she does not understand. In this example, the technology is not replacing the teacher, but it is providing a key assist by giving feedback both to the student and the teacher. (One of our master teachers refers to Khan Academy materials as “calisthenics” for his students.) They can use their class time together much more effectively. We might even get to a place in education where students advance when they have in fact mastered material, rather than merely because a certain amount of time has elapsed and they have received a passing grade. At our school, we have chosen to go a few steps farther. In partnership with Khan Academy, many of our teachers are transposing long-used problems in mathematics—and, soon, in economics—into online materials. A student who seeks to learn BC Calculus today on Khan Academy is likely to be using problems developed and taught by our faculty. We see the benefit of this activity as taking many forms. For one thing, teachers are already offering their expertise now to hundreds of thousands more people, for free, than ever before, which we take to be a good thing. For another, our teachers are learning, as professional development, about what works online and how teaching and learning are changing—by working day in and day out themselves with the technology, with the experts at Khan Academy as their guides. And finally, our teachers are getting data back about the relative effectiveness of certain problems and approaches to teaching complex material. The greatest benefit could be, in fact, that we will improve the teaching that happens on the ground, at our residential school, from exposing our materials for free to a huge audience of learners. Not everything gets better when it is taught with technology. It is unclear to me that a great text—to stick with the Russian theme, Dostoyevsky’s The Brothers Karamazov—is better taught using a digital version on an iPad. The student response paper (positing what might have happened next to Alyosha, had Dostoyevsky ever gotten around to writing the sequel he had planned) might be written in Microsoft Word and submitted by email, with comments either in ink or inline using the comments function, but the technology is not really adding much value along the way. Technology can certainly help in the humanities, however, just as it can in the quantitative disciplines. Where technology might help in this example is that the student might be able to use digital archives to find an annotated version of the text, discover contemporary images from 19th-century Russia, or consult a digital map that sets in context some of the themes of the book. Perhaps a final project would call upon the student to create a digital portfolio related to the work or a multimedia presentation to share with the class. Again, the technology would not be in the lead in these examples, but rather would function as a helpful tool to accomplish other pedagogical aims. I could provide many more examples of where technology can help improve learning outcomes, but the essential point is that we can make teaching and learning much better over time across a wide range of disciplines. I favor approaches that begin with clear pedagogical goals. Those who believe in project-based learning, experiential learning, interdisciplinary approaches, informal learning techniques, gamification, and other change-oriented teaching approaches can put technology to work in productive ways. I favor approaches that call upon the latest research into how the brain works and how learning occurs for kids. Schools ought to develop cultures where careful experimentation with these techniques is encouraged and is coupled with sound methods of assessment of learning outcomes. When techniques work in controlled settings, we should share them—within and across schools. The benefits to be gained, for students and teachers alike, are exciting to behold. A theory that pulls these approaches together, mediated sometimes by technology and sometimes not, is called “connected learning,” championed by the MacArthur Foundation and many of its education grantees. The digital age comes with big challenges and equally big opportunities. If you were an investor, you might call technology “high beta” in this respect. It is our job as parents and as teachers to seize what is great about this period of change and give our students the tools to head off the worst of the excesses. Most important, the use of technology needs to be balanced. We need to kick our kids outside to play and run around with a soccer ball or basketball or whatever appeals to them. We need them to be able to play together on teams that build character and camaraderie. They ought to learn the drums, the piano or the violin —or to paint or dance—with technology nowhere in sight. We need them to spend time with each other without devices, as well as to learn how to interact with one another effectively online. We ought to put them face-to-face with a devoted teacher around a table, arguing about a great text that stretches their imagination and their hearts. And we need to be great role models in these respects, putting away our phones when we meet at the table for dinner. These things still matter in families and at schools, and we can and should make that clear through our own actions. Much turns on our ability to do so. John Palfrey is Head of School at Phillips Academy Andover, a 9th through 12th grade boarding and day school in Andover, Massachusetts. He is the author, with Urs Gasser, of Born Digital: Understanding the First Generation of Digital Natives (Basic Books, 2008).